Debut author Jan Hahn’s novel, An Arranged Marriage, begs the question, “can a marriage of convenience ever lead to true love?” In Hahn’s impressive alteration of Jane Austen’s Pride & Prejudice, days after Miss Elizabeth Bennet stringently refuses the proposal of Mr. Fitzwilliam Darcy at Hunsford, her beloved father dies, leaving the family with meager resources and an estate entailed to their toad-eating cousin, Mr. Collins. Half a year later, as the ladies of Longbourn are packing to make way for the new owner, Mr. Darcy offers for Elizabeth’s hand once again. Despite her passionate dislike and distrust of the man, Elizabeth, with a grievous and bitter heart, accepts his proposal, saving her family from ruination and despair. Refreshingly narrated from Elizabeth’s keen and often caustic perspective, we are privy to her inner most thoughts as she struggles to conquer her turmoil of the loss of her father; the disgrace of her youngest sister; the humiliation of her eldest sister; the anxiety of nearly losing her home; and of course, the distress from this arranged marriage. And yet most disconcerting to her psyche is her blossoming passion for the last man in the world she could ever be prevailed upon to marry. I first discovered the writings of “JanH” in February of 2007 on-line at Mrs. Darcy’s Story Site. In fact, I read this very story in one sitting, into the wee hours of the morning, only to discover to my horror, for some unknown reason, my computer would not scroll past Chapter 12! Fortunately, some kind soul at the site’s Forum sent me a link so that I could finish the story. Ever since I have long wished that this talented author would publish her stories in print, so that this confirmed fan-girl could have them in my belonging. Alas, this whimsical wish has come to fruition. Congratulations, Jan Hahn! 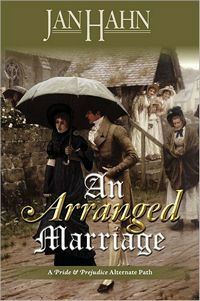 In a demesne of numerous Darcy and Elizabeth books available these days, An Arranged Marriage is at the top of my stacks, ready to be re-read. Again, and again, wherever the book falls open. It’s THAT enjoyable! A must read. I look forward to reading her next offering, The Journey due out in Fall 2011. What a lovely review – definitely put on my wish list! This sounds fantastic! I would really love to read it! Excellent review Christina, as always! I can’t wait to read this and have just ordered it from Amazon.com. Just wish it had been available for my Kindle. I am not usually someone who reads sequels of Austen books, but your review is making me rethink that tendency with this book, thank you. Oh and I see from Sherry that it’s not on kindle? Dang! I love Jan Hahns writing! When it comes to JAFF, she is exceptional! This was one of the first stories I read when I discovered the mrsdarcy site. I can’t wait to get my hands on the book! Great review! I so agree witht the 5 stars! Its not on kindle? Well I don’t doubt that the publishers at Meryton Press will hear your cry of alarm and do something about it. It would be a shame to miss out on this book. So glad you liked my review. The story told from Lizzy’s POV is wonderful. Her voice just comes right off the page! Great review! My copy just arrived from Amazon last Thursday and I am very much looking forward to starting it! I believe I ordered this already and I’m really looking forward to reading it! I loved this review and am even more excited to read it after this review. Oh dear! What is a lover of all-things-Austen to do? My “to-read” list would probably reach to the second story of my home by now. However, as an excellent review is supposed to, this sequel sounds so enticingly different than the others and with a 5/5 rating it piques my curiosity. I’ll have to add this one too! Full speed ahead….. This sounds so charming and inventive — I rather like the exploration of an arranged marriage and the possibility of love. Will keep my eye out for this! Thank you, Christina! Your generosity overwhelms me! I feel doubly blessed – to have found Jane Austen and to have readers who like my work. Thank you, thank you, thank you! Jan, Not generous… just honest. I say what I mean, and mean what I say– especially for reviews here at AustenProse. Believe me, if I didn’t like the book or the writing, my review would reflect as much. It’s a great book! And truly, I can’t wait for more of your work to be published. By the way– Beautiful cover with Elizabeth in mourning clothes. Nice subtle touch. This looks like a great book–I haven’t read it yet, but hope I get the chance! I was impressed with Christina B’s review, and the 5 out 5 Regency Stars definitely makes it worth the read. Congratulations to Jan on the great story! Love all of Jan’s stories. Very emotional and well written. Goodness, nothing like Darcy staring intently into your eyes. I’m definitely going to have to read this one. Wow–this review makes me want to run right out to the bookstore or Amazon and clear my plans for the rest of the day! What a wonderous site that shares book recommendations…I’m in danger of spending more time here than on my work! Thanks for adding another book to my towering to-be-read-soon stack…I can’t wait to get my hands on this one! Sounds like a great story. I will add this to my TBR list. Sorry to write this out, but the review and the novel itself are totally different. I was eager to find the book after reading this nice review, but frankly, it didn’t live up to my humble expectations. The plot of the story is mediocre, Elizabeth turns into a simpleton, Darcy mean and stupidly mysterious. I like the idea of an arranged marriage blossoming into the discovery of true love and trust though. I hope the writer rewrite it with more twists and better details. Thank you.